Click Here to Download our PDF. We have the proper equipment and training to provide a properly finished flooring system. We are certified applicators technically proficient in the use of all materials we apply on each project. We strive to provide the finest floors with excellent customer service and attention to detail. Some of the very same things that create advantages for acid stain can present irregularities in the final color. Variations in color are to be expected with acid stain however, some may be objectionable. Some causes of undesirable/objectionable results are: chemical additives, curing compounds, oil, rust, glue, paint, spray foam insulation, repaired/patched areas, tape/adhesives, caulk, food/drinks, etc. Therefore, acid stain accentuates imperfections as well as the beauty of your concrete. These imperfections may be seen or unseen prior to application. We have methods available that may minimize and/or remedy some of these issues. Diamond polishing has 3 main stages and is similar to sanding wood. Concrete Worx is a member of the Concrete Polishing Association of America (CPAA), we use the CPAA’s definitions and guidelines regarding polished concrete. The steps required by a polishing technician to transform the concrete substrate into a specified finished gloss. These steps may include a sequence of grits of bonded abrasives spanning the grinding, honing and polishing stages (i.e. 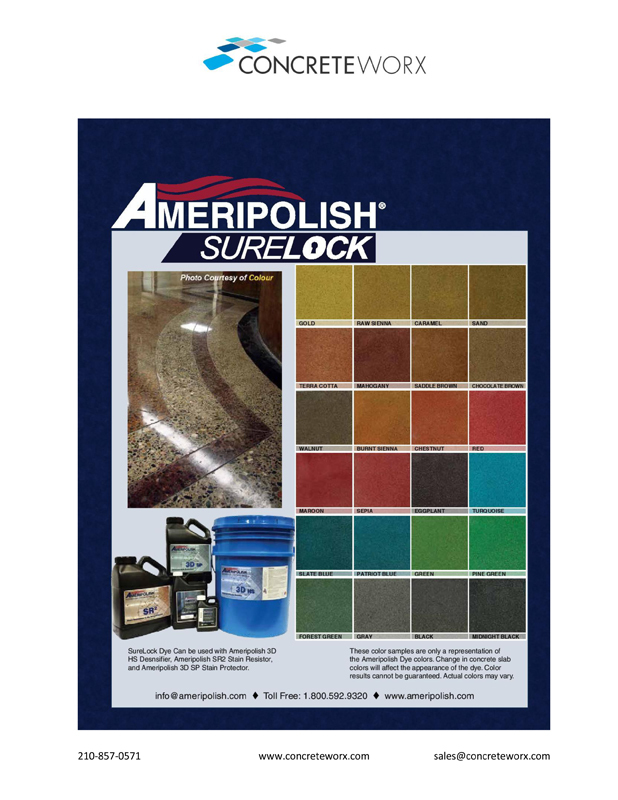 70 grit metal bond, 120 grit metal bond, 50 grit hybrid bond, 100 grit hybrid bond, 200 grit resin bond, 400 grit resin bond, 800 grit resin bond, 1500 grit resin bond, 3000 grit resin bond). The steps of the polishing process that refines the concrete in preparation for the honing stage. This stage is typically the beginning for Class C and D specified floors and may meet the requirements for a level 1 specified gloss. This stage consists of any bonded abrasive that is 100 grit or lower. The steps of the polishing process that refines the concrete in preparation for the polishing stage. This stage can sometimes be the beginning steps for Class B specified floors and may meet the requirements for a level 2 specified gloss. This stage consists of diamond tooling within the 100-400 grit range. The final stages of the polishing process that refines the concrete to the specified finished gloss levels 3 or 4. This stage consists of diamond tooling that is 800 grit or higher. The application of hardener, a clear odorless (No VOC’s) liquid, is applied during the grinding/honing stages. The amount and number of times it is applied is based on the characteristics of the concrete. 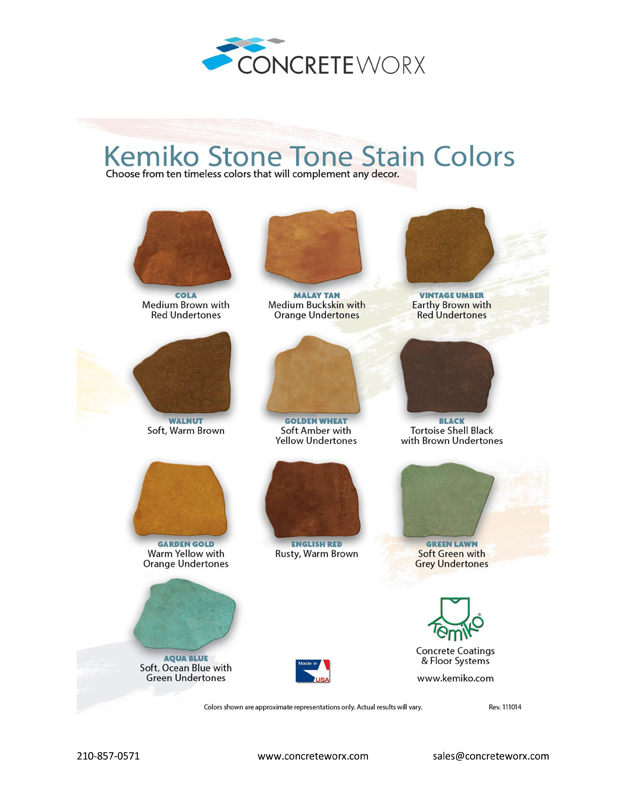 If a stain (dye) is selected it is usually applied during the honing stage. Concrete Worx uses a combination of wet and dry processes for the various stages. We feel this provides a better finished product. Each slab has it’s own unique characteristics, if you are considering polished concrete, please contact us. We will be happy to answer any questions you may have. Concrete Worx was founded in April of 2007 by Ken Colemere. Since then we have invested in equipment and ongoing training to provide our clients with superior concrete flooring solutions. Contact us today to start work on your next metallic epoxy coatings projects. We specialize in metallic epoxy coatings Diamond Polished Concrete, Seamless Epoxy Costings, and Decorative Concrete. We have the skills and expertise to meet and exceed your expectations. Concrete Worx offers polished concrete services and concrete polishing throughout Texas, including the areas of San Antonio, Schertz, Helotes, New Braunfels, Bulverde, Canyon Lake, Spring Branch, Bergheim, Boerne, Fair Oaks Ranch, Comfort, Sisterdale, Kerrville, Ingram, Center Point, Wimberley, San Marcos, Kyle, Buda, Dripping Springs, Seguin, Marion, Cibolo, Santa Clara, Blanco, Johnson City, Fredericksburg, Cherry Spring, Bandera, Pipe Creek, Hondo, Castroville, Austin, Pflugerville, Round Rock, Cedar Park, Lakeway and surrounding areas. Concrete Worx also proudly serves the following counties; Kendall, Bexar, Comal, Kerr, Hays, Guadalupe, Blanco, Bandera, Gillespie, Medina and Travis counties. Let us apply our professional metallic epoxy coatings skills in your warehouse, industrial center, parking garages, auto services centers, schools, high end showrooms and more.